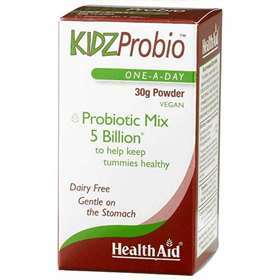 Health Aid Kidz Probio Once-A-Day Probiotic Mix 30g Powder is formulation containing special viable strains of Lactobacillus and Bifidobacterium designed with your child's well-being in mind. Fortified with a prebiotic (FOS); KidzProbio helps keep the digestive system in balance, provides essential support under conditions of digestive disorders and helps regain flora balance following antibiotic therapy. Health Aid uses special acid & bile resistant strains, which prevent the stomach juices destroying the ingredients before they reach the intestines, ensuring their purity and potency. Mix 1 quarter teaspoon (one gram) with water and feed to child once daily. Can be added to baby foods, formula, or liquids. Must be used immediately once mixed in food or water. Do not exceed recommended daily intake unless advised by a suitably qualified person. B.lactis, L.acidophilus, Fructo-Oligosaccharides (FOS), Bulking Agent (rice maltodextrin), Anti-caking Agent (silicon dioxide). If diarrhoea occurs while taking this product, reduce intake to half the recommended amount.